With Thanksgiving around the corner, you’ll have your hands full with guests and preparations. The last thing you need are little ones running around under your feet. Get your self prepped, your home trimmed, and the table set with grace by giving your kids projects of their own. a sense of purpose and keeps them busy while you plan your feast. Plus using any of their crafts as part of the holiday décor will give them an extra sense of pride and ownership. These cute and creative napkin holders are cheap to make but will take time and focus from your little ones. Kids from ages 5 and up can have hours of fun making napkin holders that will play a big eye-popping role on your Thanksgiving dinner table. To make: Take a 4 by 5.5 inch piece of felt and glue 12 popsicle sticks on one side only. After you’re finished, you’ll end up with an uncovered margin. Once the glue does dry, form a ring by gluing the overlapped/uncovered piece to itself. Then, take an assortment of buttons (available for pennies at any fabric store) and have kids glue the buttons onto the popsicle sticks. If you’ve got younger children working on this project, then get all the materials prepped and ready to go. Cut out the felt rectangles and if needed, guide them through one ring to get them comfortable with the project. These adorable turkeys are easy to make and great for ages 6 and up. To make: You’ll need a paper cup, construction paper to make the feathers, sets of wiggly eyes, pom poms for the head, and a bit of felt for the beak and feet. Begin with cutting out feathers, and have kids draw or paint on both sides. Encourage them to be creative, using patterns, dots, stripes, etc. For extra effect, try using real or synthetic feathers, mixing them in with the paper ones. Then have them glue the bottom of the feathers to an upside down cup, holding it in place till the glue dries. Then use the rest of the materials to finish assembling the turkey – adding the feet, head and facial features. 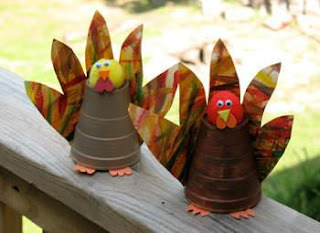 Cup Turkeys can be used as either table décor or as place cards for your dinner table. To turn it into a game for guests with folded place cards hidden under every cup. Requiring guests to lift up the paper cups to figure out where they’re sitting will be an extra little game your kids will delight in. 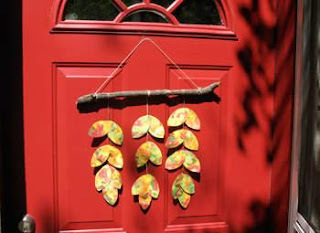 Extremely easy to make for kids 5 and up, leafy door hangers are great fall ornaments for your home. Hang them off the front door as an instant invite and as an alternative to wreathes. Kids will relish seeing their artwork in front of the house for everyone to see. To make: Have kids cut out paper leaves and paint them with finger paints. Inspire them to get creative by mixing colors and straying from traditional leaf shades. For older children, have them draw and paint on the leaves, creating intricate designs and doodles. Glue the completed leaves on a cord/string (a jewelry cord works well). Then tie 3-5 strings of leaves onto a sturdy stick that kids can find in their yard. A cord or yarn tied to each end of the stick can serve as a hanger. In addition to giving you some free time, holiday arts and crafts help nurture children and develop a sense of belonging. And since fall brings colder weather and less daylight hours, kids need something to keep them occupied since this means less playtime outdoors. "With so much indoor time, try leaving an air purifier switched on, so that when they are indoors, they have as much clean air (if not more) than if they were outdoors. And with all your holiday cooking, having an extra room air cleaner in your home or kitchen to filter the food odors, especially if you expect to be frying. This ensures your family is not only having a happy holiday, but a healthy one too. A great air purifier to try is the BlueAir Room Air Purifier, which is not only discreet but quiet and effective. “Fun Thanksgiving Activities for Kids” is brought to you by one of our very favorite Guest Bloggers, Shireen Qudosi and http://www.air-purifier-home.com. I can't wait to try the leaf door hanger with my Hay-Jay! She is so into leaves as she has seen the beautiful Fall leaf colors on TV, in books and in magazines. Thanks so much Shireen." 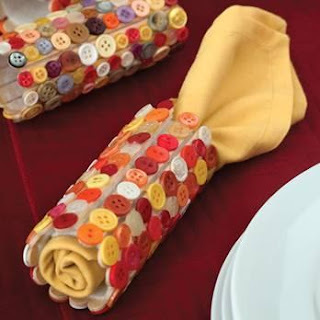 Hi Elaine, I made the button napkin holders with my kids and neice and nephew. they turned out cute, but I haven't posted them yet...I guess I am too late now. Glad you found us now.